Special pricing for the Canon G1100 & G1130 Document Scanner through September 2013 ONLY! Canon has in place an instant rebate program in place for two scanners now through September 30, 2013. 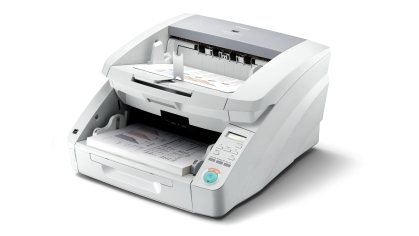 The Canon DR-G1100 and the Canon DR-G1130 document scanners offer enhanced productivity through high-performance, reliable, and flexible scanning for any document management system. Scanner One, Inc. has the following special pricing in place after the rebate. On top of the special pricing for these two scanners, Canon is offering a trade-in rebate through September 30th 2013. Receive one trade-in rebate for each qualifying trade-in submitted with the purchase of a NEW Canon scanner. To qualify you must provide a picture of the trade-in unit, and a picture of the trade-in serial plate. The DR-G1100 and DR-G1130 trade-in unit must have a minimum speed of 40ppm, based on Letter-size in portrait. Please contact a Scanner One Representative to verify if the trade-in unit qualifies. Don’t miss out on the opportunity to purchase a low-volume production scanner that supports up to 11X17 documents, has a 500 sheet document feeder, Staple Detection, Double feed Detection and many more features built into the scanner. If you are scanning 5,000 pages per day up to 5,000 pages per month this could be the right scanner for you. These units are set up for fast scanning with reliability unmatched by any other manufacture. Call us for a formal quote or place the order online with ScannerOne. Scanner One, Inc. & One Office Solution a Division of Scanner One, Inc.